3 Feedbacks on "Repeat Offender Charged with Arson in Atlanta Overpass Fire"
I get it now! 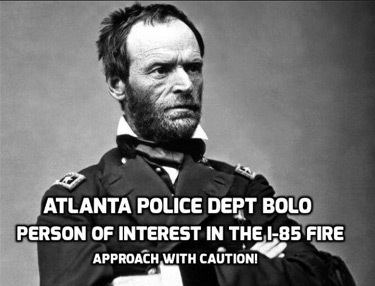 The March to the Sea was Sherman exercising his White Supremacy! Good one,JDZ. I hope all communities rethink the idiocy of storing piles of flammable materials under overpasses. I would also hope that communities begin to understand the risk and harm homeless people are to the citizens and the infrastructure. The way most cities choose to deal with homeless is to either ignore them or reward them and typically it is a combination of these. If you or I committed the many crimes and offenses that the homeless commit on a daily basis we would go to jail. The homeless are given food and blankets for their crimes. That oughta fix it.